Recently (and not so recently) I have received 3 awards from 3 wonderful bloggers. I am humbled by their generousity in giving me these awards. 1. I love a cool breeze on a hot summer night. 2. I love people who can appreciate the art of food and hospitality. 3. I love people who can weave words into stories that take you to places you’d never think of going. 4. I love TV shows and movies that are truly works of art. 6. I love giving gifts to the people who mean the most to me. From Spryte of Spryte's Place, I received the Amazing Blog award. Thank you Spryte! I think your blog is amazing too. I’m passing this award along to the 10 bloggers I have listed above. Go visit all these amazing bloggers! Once again, thank you for the awards, Spryte, Jeanne and Nicisme. Thanks ever so much for the award! I'm flattered! Dragon, thank you so much for the award. It's special when it comes from someone with some good cooking chops and you're a local gal. I'd like to return the favour next time you're in town, K? Congrats with all the wonderful awards. You are very welcome and thanks!! And congrats on your other awards too!! CONGRATS Paula...very well deserved indeed! 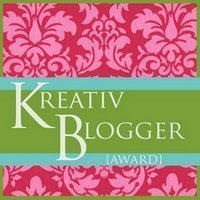 Congratulations and thank you for giving us the Kreativ Blogger award! Congrats on the awards. You have a great blog! Congrats on all the awards! You have a wonderful blog! Thanks for the awar4d Paula! I have been so busy with work this past weekend I didn't get to visit! Thank you again for the award! Oh thank you! Thank you for thinking of me! And congratulations! Thanks so much for the awards sweetie! They mean a lot to me♥.